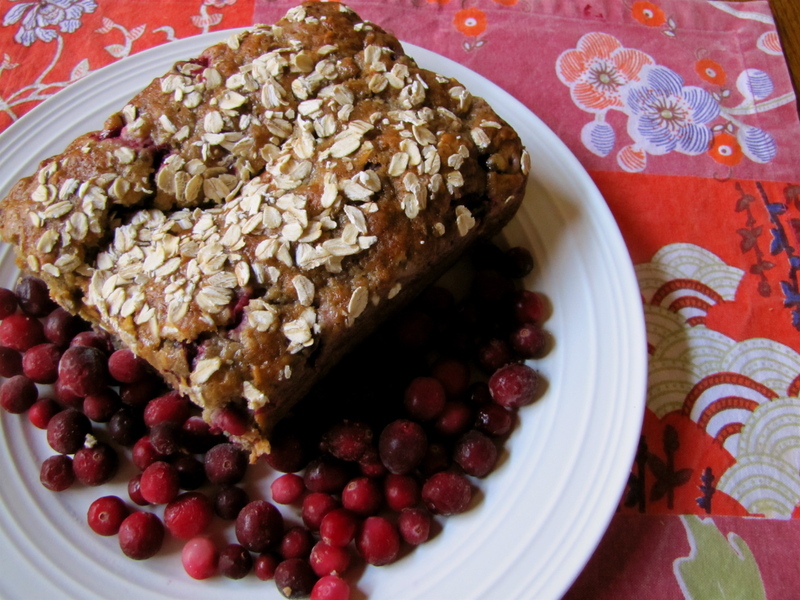 Cranberry Oat Banana Bread – Voila! Some say holiday foods are filled with gingerbread and cranberries and peppermint. Apparently my holiday recipes center on bananas! It’s not actually that bad. This is just the second banana bread I’ve made in two weeks. This one was a huge hit. James said it was “complex, nuanced, multi-layered, moist and delicious.” What a review! 1. In a medium bowl, mix together all-purpose flour, rolled oats, baking powder, baking soda, cloves, all-spice and salt. 2. In a measuring cup, measure out the buttermilk. To the buttermilk, add the vegetable oil and vanilla extract and mix until combined. 3. In a large bowl, using an electric mixer, beat eggs, light brown sugar and white sugar together until thick and pale, approximately 3-5 minutes. Mix in smashed banana and buttermilk mixture. In two batches, add flour mixture, mixing until just combined, being sure not to overmix. 4. Fold in cranberries and transfer batter to prepared loaf pan. Top with a handful of rolled oats. 5. Bake quick bread for 1 hour, or until a tester inserted into the center comes out clean. Invert bread onto a rack to cool. Bread will be moist up to 3-4 days. Wrap tightly in plastic wrap to preserve its freshness.